The J&J's transparent tone and excellent touch sensitivity make it a perfect partner for any non-master amp when a bit more drive is needed. Simple controls. Transparent tone. Response. The non-slip base that doesn't stay put. Sonic Edge is the pedal brand of Sacramento-based Fargen amps, whose Olde 800 head has mightily inspired us in recent weeks. 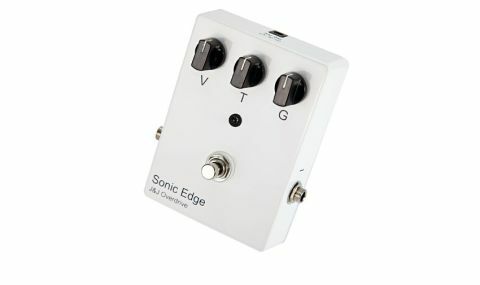 The Sonic Edge range includes two stompboxes: a clean boost/compressor called the Tumbleweed, and this no-frills J&J Overdrive. "We tried it with a variety of amps and it never disappointed"
The J&J is a pure analogue pedal with a pair of JFET transistors on a small single-sided PCB, complemented with film capacitors and carbon comp resistors. There's a true bypass in/out switch, with power provided from an PP3 or a standard DC socket. A non- slip rubber pad lies underneath the cast-alloy box, but the plastic battery cover sits a little proud, causing the pedal to skid around on hard floors. There are three knobs - for volume, tone and gain - and a blue status LED. The J&J has a wide gain range that goes from clean boost up to a decent Tube Screamer-style drive, with a smooth but effective tone control that dials in just the right amount of top. We tried it with a variety of amps and it never disappointed, leaving the amp's native tone intact and making solos sing with sustain and bite.